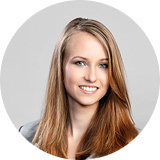 Verena Zeiner studied journalism and sociology and has gained experience in various areas of human resource management. At Iventa, she is involved in personnel and organisational development and supports the team as an expert, especially in the conception and implementation of location determinations and potential analyses. Additionally, she coordinates internal processes and sales.